One of the most renowned Manufacturers, Exporters and Suppliers of Tunnel Oven; we offer the most reliable and certified Ovens. 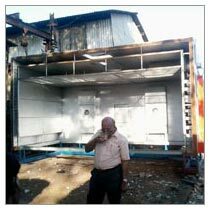 We have rich industry experience that we have used to bring forth the quality assured and tested Tunnel Oven for different types of processing; manufactured under the watchful supervision of experts. We offer Tunnel Oven that is stringently controlled by a PLC thus includes complete temperature recording facilities. The Tunnel Oven has conveyors that are designed to run continuously with pneumatic vertical doors at the feed and discharge ends of the conveyors.